iBox Customise designed a pair of custom boxing gloves for us to allow us to test their gloves out and provide our feedback for them. Unlike our other Boxing Glove Reviews so far, these are custom gloves, which means that you can actually design your own, with your choice of colours, padding and build. As well as that you can even have your own custom text, initials or logo embroidered on to the gloves. This review should give a good idea what to expect from an iBox glove, but you can choose to design yours slightly differently if you want. The gloves come in sizes 8oz to 20oz, which is an impressive range compared to brands. The bigger gloves may be especially useful for anyone who is already a seriously hard hitter, to get the most protection. We decided just to go for a fairly standard 16oz version, to get a good idea of the glove’s padding, and also to give plenty of protection, especially when sparring. The gloves are very slightly bulkier than the average 16oz glove, which is mainly evident in the thick knuckle padding, as well as the thick foam bars on both sides of the wrist. These gloves are all about the visuals, and creating your own style. iBox add a small label on the inside of the wrist, but other than that, how the gloves look is completely up to you. When designing these gloves, there are 7 different areas for you to play with; the main palm colour, the split palm cover, main thumb colour, split palm colour, ridges (or velcro if you decide on that version), trimming, and of course the main glove body colour. Obviously it’s up to you whether you want to use split colours on the thumb and palm. With each section you then have a choice of colours and materials, allowing you to choose between standard leather colours, neon colours, metallic colours, and even ‘skins’, which gives you a choice of various exotic leather textures. The guys over at iBox Customise offered to design a glove to capture the visuals of the Fight Quality brand, so we let them take over the design process. We’re pretty impressed with how they turned out. The coloured leather is nice and vibrant, contrasting well with the black. 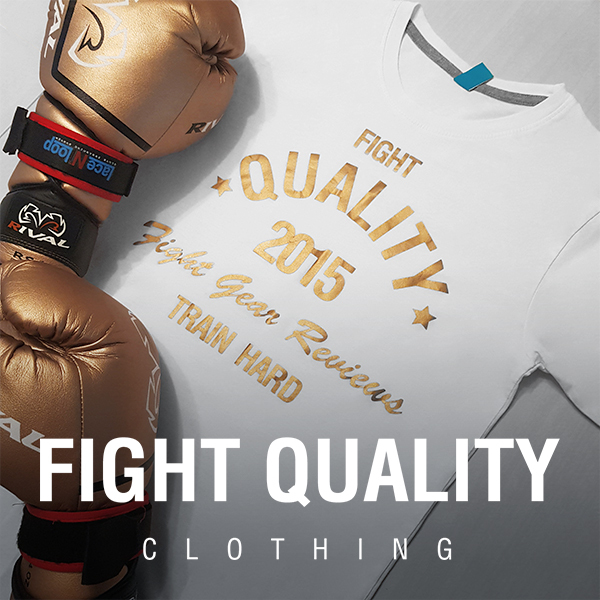 More importantly they’ve embroidered ‘Fight Quality’ as well as our iconic ‘ring’ logo. The embroidered visuals not only look great from afar, but the stitching also provides a great texture which looks great up close. Below are a number of different designs to show you an example of what they’re capable of. Style is important, but with a high end glove like this, the quality needs to be up to scratch as well. On the outside, the leather is great. It feels fairly smooth to the touch, and seems to be sturdy enough that I can see it lasting well. It’s also pulled across the body of the glove nice and tightly, leaving basically zero creases on the back of the hand or around the thumb crease, even after a fair amount of use. Not only that, but the folds at the sides of the fingers where the glove curves are quite possibly the neatest that I’ve seen on a glove so far. I tend to use parrying a lot when boxing, so the palms of my gloves probably see a little more wear than with most people. I’ve noticed very slight scuff marks on the palm, near the laces. As far as I can see, that’s the only example of wear and tear showing on the gloves at all so far. I did also notice a little bit of the yellow rubbing on to other gear, such as hand wraps, however that’s not uncommon amongst brighter colours. On the inside, they’ve opted to use a super soft lining. I’m a big fan of softer linings, because they provide a much higher level of comfort and leave you with a true premium feel. There are some drawbacks, such as the fact it seems to absorb sweat a lot more, however with the right care, it’s pretty easy to work around. Unfortunately I had a bit of an issue with a little excess material in the finger compartment of one glove. After a little bit of wiggling and adjusting, this is now rarely an issue though, and either way it’s the sort of issue which is easily forgotten once the first punch is thrown. The other glove is completely fine though, so it’s probably just a slight variation in the manufacturing process. These gloves are obviously made to order, and as a result each glove is hand crafted. From taking an up-close look, I get the impression that they take a lot of pride in building the gloves. I’ve already mentioned the neatness of the leather folds, but the stitching holding the glove together is brilliantly done too. It’s hard to spot any issues at all, and there aren’t any loose threads or mis-stitches at all. I was a little worried the embroidered graphics would come loose quickly, however they’ve been holding firmly in place so far and look exactly the same as they did out of the box. In terms of shape, these gloves are more or less what you’d expect to see from a Pro lace-up glove, almost similar to Grant gloves. There are a couple of visible differences though, such as the padding looking slightly less rounded at the sides of the iBox gloves, as well as having slightly thicker padded bars on the inside of the wrist. These padded bars are actually surprisingly thick, formed with a soft padding, which help add a great amount of comfort and support. I also find that having thicker padding here means you can lace up the gloves fairly tighter than normal without it being any less comfortable. The thumb feels slightly higher on the hand than most other gloves, but I’ve found it to be a comfortable position overall. It curves round slightly to fit in seamlessly with the main glove padding when clenching for a fist. Depending on your preferences, there are three different foams you can choose from; IMF (Injection Moulded Foam), MID (Soft inner/Hard exterior) or Orthopaedic foam. Our glove is made with the MID foam, but you may prefer one of the other two options. When I first got these gloves, I was slightly surprised by how firm the outer layer of padding actually is. It’s probably firmer than any of the other gloves I’ve reviewed. When wearing the gloves, you wouldn’t be able to tell though, because the inner layer of padding is much softer. It’s a very noticeable difference comparing the inside and outside of the gloves. The end result is a glove which is both hard hitting and protective to the hand at the same time. I’ve used these gloves for a bit of everything so far – Pad work, on a heavy bag, combination drills and also during sparring, and it performs well in all areas. From my own use however, I have to say I think the padding in these gloves is absolutely perfect for hitting a heavy bag, allowing you to smash strikes in as hard as possible with a great sound, whilst the majority of the shock is completely dispersed. I’ve also really been enjoying these in sparring because of the great fit, although I do worry that sparring partners (especially those who are less experienced) may not appreciate the harder padding quite as much. You’ll pay quite a bit for these gloves, with the prices ranging between £170 and £190 depending on which Velcro/Lace option you choose, but for a premium glove like this, that’s actually not bad. That price is on parr with some of the more basic Cleto Reyes gloves (in the UK at least), and far less than you’re likely to find any Grant or Winning boxing gloves for. Add in the fact you get to create your perfect glove, deciding on how you want the wrist, the padding, the colours and materials, as well as including your own design. There’s something incredibly satisfying about having a custom glove made, and knowing it’s completely unique. There are a number of smaller companies offering similar services, but iBox Customise focus solely on custom gear, and have perfected the process, offering the level of quality you would expect from any high-end glove. If you decide to create your own iBox Customise glove, why not send us or tag us in a photo of how they turned out on Twitter, Facebook or Instagram, or simply add a link in the comments below! What do you know about their orthopaedic glove? I’m guessing it’s meant to protect the hand more, but their site doesn’t detail any benefits/materials or qualification?? Hi Sharujan, we don’t sell these gloves ourselves, this is just a review of the custom gloves they produced for us! If you get in contact with the guys at http://www.iboxcustomise.com I’m sure they’ll be happy to help you out.